Is your teen prepared for the real world of personal communication? Set your kids up to succeed with the lost art of social skills. Are your kids glued to their phones and out of touch with the real world? Do your teens slouch and have poor eye contact? Do you worry that their inability to communicate will keep them from getting a good job? If so, then it’s time for a crash course in the social skills and job skills that will lead to their success. Let award-winning author Kirt Manecke be your guide. Developed by a team of teens, parents, and educators, the proven methods in Manecke’s book provide your kids with the people skills and confidence they’ll need throughout their lives. Whether your teen is looking for work, holding down a job, making friends, or taking part in leadership or service positions, Smile and Succeed for Teens will give them the education he or she needs to thrive. Perfect for special education, ADHD, Down Syndrome, and Autism too. Each lesson is presented in an entertaining style, with quips, tips, and easy-to-adopt strategies that will teach your teenager the critical elements of good communication. Filled with fun and informative illustrations with educational captions. And the best part is, teenagers enjoy reading it! 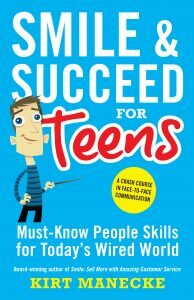 Parents, you can help your teens learn the skills in Smile & Succeed for Teens by using the book in conjunction with the Parent’s Guide for Smile & Succeed for Teens (sold separately on Amazon) to give your teens the edge. * Succeed at work and stand out to their employer, and much, much more! The winner of the Mom’s Choice Gold Award for excellence, Teachers’ Choice Award, and the IP Gold Award recognizing excellence, Smile & Succeed for Teens is an attention-grabbing, easy-to-use course that has already supplied thousands of teens with the skills to do better in school, develop meaningful relationships, and establish fulfilling careers. If you want to equip your teenager for success in work and life, then you can’t afford to miss Manecke’s essential guide.